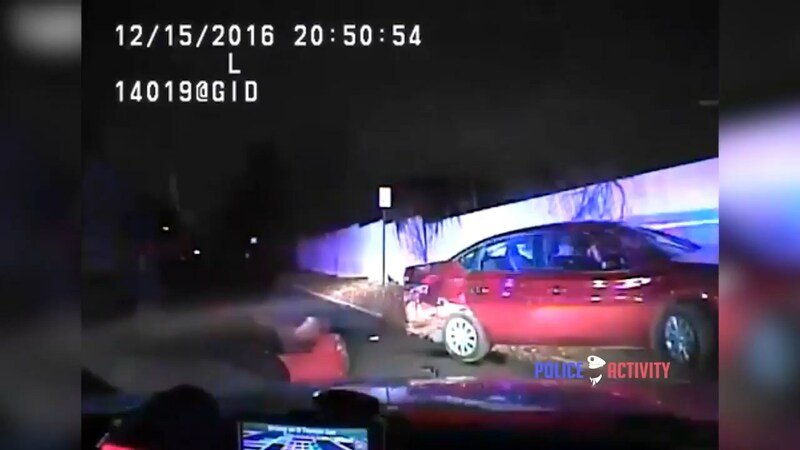 Dash cam video released from Tulsa police shows a patrol car ramming a stolen car, and another hitting a suspect, after a police chase last month. It started as a carjacking and then a police chase on December 15th, 2016, with dozens of Tulsa police officers involved. Officers said they followed four suspects in a stolen red Corolla from 46th and North Mingo into the Elba Terrace Mobile Home Park near Pine and Yale. During the chase, the suspects shot at officers with BB guns, they said. “They’re doing the trailer park here. Only one way in, one way out here,” officers say in the video. At the mobile home park, the driver dumps out three suspects – a patrol car hits one of them. They arrested that suspect – 26-year-old Sonny McCombs – on eleven different complaints, including armed robbery and possession of a firearm, as well as 18-year-old Tevin Whitetree for complaints including shooting with intent to kill. Meanwhile, the driver kept going. “Fixin’ to bail. Still runnin’, still runnin’, I still got the car. Still behind ’em, still behind ’em,” you hear in the video. He led officers west for about three miles, then, tried to turn left, which is when a patrol car rams him, causing him to spin out and stop. The driver gets out of the car and tries to run. Officers fire several shots at him, shooting him in the back. Chekota Whitetree, 21, was taken to the hospital and then to the Tulsa County Jail.Officers also arrested a fourth suspect – a 14-year-old boy. The others are still at the Tulsa County Jail.